This is so easy you can make this before work. I did. It’s as easy as dicing up the apples and cooking them in the skillet. No joke. Begin by cooking the oatmeal. While the oatmeal cooks, make the apples. Dice the apples into small-ish pieces and melt the butter in a small skillet. Like a good Minnesotan, I use honeycrisp. You don’t want anything too tart. Add the sugar, cinnamon, nutmeg, and apples to the butter. Cook until the apples just begin to soften. I like them a little crunchy, so that’s what I do. If you want them soft, cook them a couple minutes longer. You could just eat the apples straight from the skillet or you can resist and remember you have oatmeal for your apples. 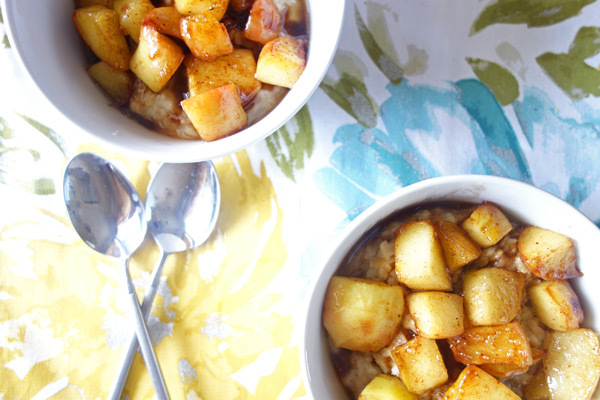 Divide the oatmeal into two bowls and top with the apples. And that is how you have apple pie for breakfast. Heat water and milk to a boil in medium saucepan. Add oatmeal, stirring frequently until oatmeal is consistency you prefer. Dice apples, leaving peel on. In small skillet, melt butter. Add apples, sugar, cinnamon, and nutmeg. Sauté apples for 3-5 minutes until just beginning to soften. Serve oatmeal topped with apples. Yum!! This looks so warm and perfect for this time of year!